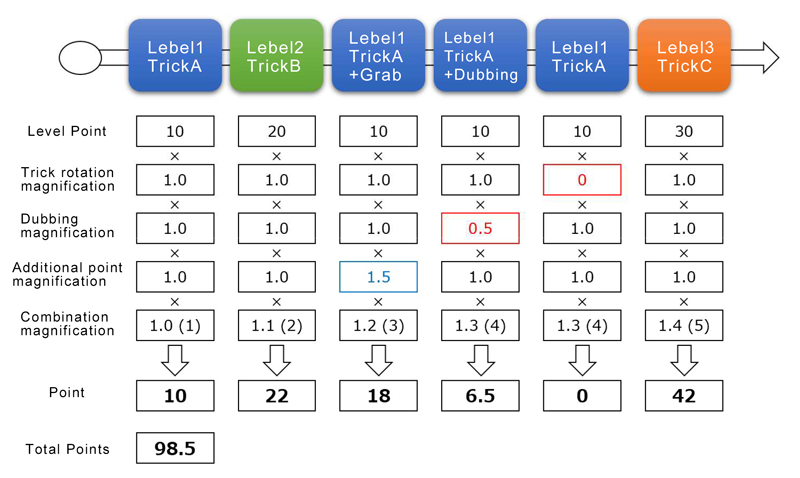 The score for each trick is calculated by below formula. Points are given to the tricks the player has made. Basically, tricks are classified as basic trick and tricks of level 1 to 10. Each level points are shown in the below table. When a trick that was not described in the list is made, the judge decides the score. If you did a trick an unlimited time in a sequence, you can get the points within 4 times with a same trick. But if you do a same trick more than 4 times, multiplication of tricks =0 point and number of combos isn’t counted. F/s and B/s tricks is different things. Combo is defined as combine consecutive tricks done while bouncing. The number of combos is incremented by 1 when the following trick is made. *In the combo, the trick made without bouncing is not counted as one. *When a single basic trick is performed during combo, it is counted as combo interruption (number of combos = 0). The dubbing magnification is set to 0.5. Combo will not be interrupted by dubbing. Grabs and styles in the trick are also counted in the point. The added point multiplication factor = 1.5. If the trick is not completed or falls, it counts as a mistake. If you make a mistake in the middle of the combo, the combo until the trick just before the mistake is count as a point. When the dynamic trick performed instead of the basic trick in the level trick is given the magnification in the below table. If the number of people in each area is less than 3, participants who has top points in all areas will be selected to the preliminary selection. We have cut off line by points. The median value + 10% of all players is taken as the pedaling threshold value. Sending video is limited to one. Upload your video with unedited and 2 minutes at the most to online storage and please send your video’s URL to the executive committee. The video format is “mp4” or “mov”. Use the fixed camera(angle), Shoot the whole body, the mat or the ground can be seen. The camera position should be set in Camera Area below (to avoid shooting from the side).